The GCB aims to provide expert insights on the development of the Chinese economy. Our Annual Report features articles written by members and partners. 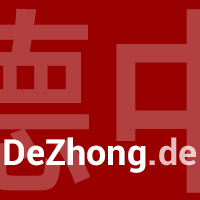 DeZhong.de offers the opportunity to find co-operation partners for German–Chinese business projects. DCW cordially invites you to visit the DCW Joint Booth at Hannover Messe. The German-Chinese Bureau of Economic Research (GCB) was established in 2013 to promote the understanding of the economic relations between China and Germany in an international context. It aims to provide insights on the development of the Chinese economy and, in particular, on the trajectory of Chinese outbound and inbound investment. The China Economic Bulletin (CEB) provides information and analysis on the Chinese economy – featuring interactive data visualisation. The GCB website features a digital library, which summarizes and links to a variety of freely accessible research. The German-Chinese Business Association (DCW), established in 1987, aims to promote economic relations between China and Germany as an impartial and non-profit organisation. Members and partners of DCW work together to enhance bilateral investment and trade relations between China and Germany. To its members and Partners, DCW serves as a platform to exchange experiences and establish new contacts. We invite You to take part and contribute to our work together with over 430 enterprises, organizations as well as experts and management personnel. German-Chinese Business Association (DCW) e.V.